Each year I am accused of pushing my agenda on students. This is usually meant in that I want my students to hold to the same belief system I have and leave my class being disciples of my thinking. This is far from true (unless the topic is college football in which case everyone should yell “Roll Tide”). I teach English which falls within the humanities. Without going into a full etymology discourse, the humanities are about being human, and in order to explore being human, I have to expose my students to different texts which encompass a wide variety of beliefs and opinions. On day one of class, we discuss what it means to be a member of a learning community and respectfully listen to others (whether it be a teacher or fellow student) who have different life experiences thus giving a wide variety of perspectives to various texts. I love hearing how different students interpret a text and make connections to it based on their experiences; my life is so much richer because of these different points of view. In AP (and even to some degree in my non-AP classes), I put together a curriculum based on skills my students need to develop and themes I want them to consider and explore. I’ve decided this year to just announce “my agenda” up front: these are the themes we will discuss this year in class. Some works are mainstream; others are not. This is intentional. Reading a variety of genres, authors, styles, and themes produce well-rounded readers which is important. The titles in red link to unit plans I do with the novels. My agenda: Religion and government used the wrong way can be bad. Also, you can impose your will on others and be heartless, but that will cost you in terms of having any meaningful relationships in life. My agenda: This text deals with themes of racism, injustice, and offers a chance to consider another perspective as Smith writes about growing up in New Orleans (he was a senior in high school when Katrina hit). 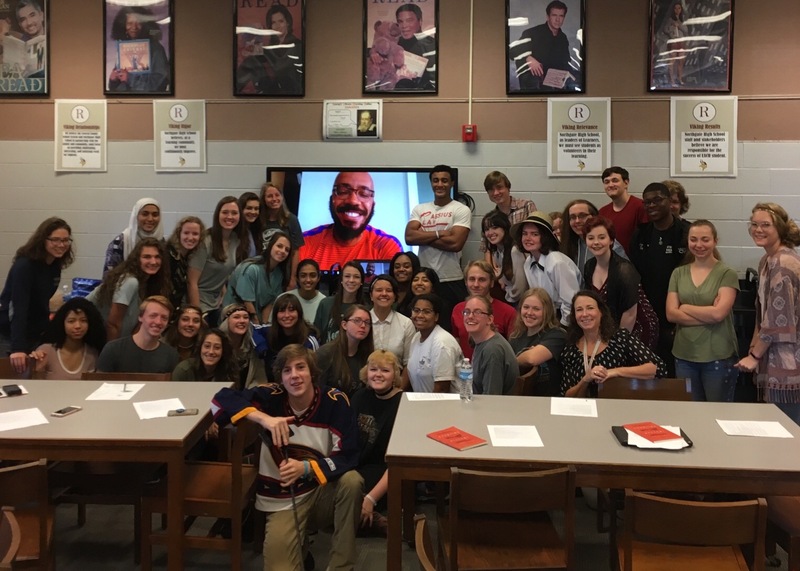 Added bonus: We Skyped with Clint Smith on September 18th after we finished reading and discussing his collection. My agenda: Just because science provides the means to do something, that doesn’t mean we should. Also, creators have a relationship to their creation. (Ironically, this text is possibly the most “Christian” text I teach). My agenda: War is personal, hard and leaves scars on people and countries for a lifetime – and longer. Tell your story the way you want it told. My agenda: Growing up is hard, and sometimes families complicate life even more. Revenge and justice are complicated and have widespread effects. Be nice to your girlfriend. <- Okay maybe this isn’t a theme, but it never hurts to have this discussion. My agenda: Think about technology and its role in your life and think about the messages you receive from the media/government/internet. Use your mind to thoughtfully weigh information. My agenda: Racism is ugly, deep-seated, and brings out the worst in people. Standing up for the right thing can be costly, but it’s still right. In addition, I have the privilege of teaching a reading remediation class this year for freshmen who want to improve their reading skills. In this class, we spend time doing choice reading and we also work with current news articles through Kelly Gallagher’s Article of the Week. I love these articles because they not only help students develop literacy skills with real-world texts, a skill they need in life, but they are also thinking about and writing on real work issues. My agenda for the year can basically be summed up in this statement: I am not pushing what to think on my students but am pushing my students to think. What is your agenda for the year?